Today two new devices have become available to purchase in India. These are the Microsoft Lumia 532, in its dual-SIM iteration, and the 32GB HTC Nexus 9 with 4G LTE support baked in. The Lumia 532's launch isn't a surprise, and it follows in the footsteps of the Lumia 435, which went on sale in the subcontinent just last week. The phone (pictured above) can be bought for INR 6,499, which means around $104 or €92, so it's pretty affordable. Then again, its specs aren't stellar by any measure. It comes with a 4-inch 480x800 touchscreen, a 5 MP rear camera, a VGA front-facing unit, 1GB of RAM, as well as 8GB of expandable internal storage. It's powered by Qualcomm's Snapdragon 200 chipset, with a 1.2 GHz quad-core Cortex-A7 CPU and Adreno 302 GPU. 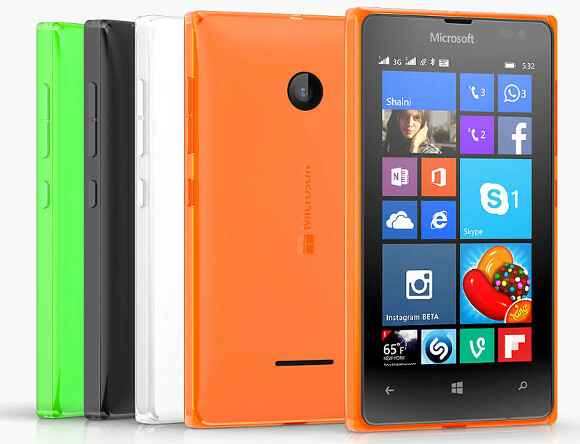 The handset has a 1,560 mAh battery and it runs Windows Phone 8.1. The HTC-made Nexus 9 has been out in India for a while now, but so far only in the Wi-Fi-only version. Now though you can purchase a 4G LTE capable variation of the tablet too, if you so wish. You'll have to head to Amazon for this, and be ready to part with no less than INR 43,073. That's about $692 or €610. At least you're getting 32GB of storage too, which is the maximum possible for this device. The LTE Nexus 9 is otherwise identical to the model sans mobile data connectivity. So you're getting the same 8.9-inch 2,048x1,536 touchscreen, Nvidia Tegra K1 SoC with dual-core 2.3 GHz Denver CPU, 2GB of RAM, 8MP primary camera with LED flash, 1.6MP front snapper, and the 6,700 mAh battery. Like its sibling, the Nexus 9 LTE runs Android 5.0 Lollipop. a 4'' display handset such as this sounds like a killer simple device. The larger live tiles are great for seniors.